Gluten free. GMO free corn. Recipe No. 15 The Dipper* layered with juicy Mediterranean olives, subtly sweet Red Peppers and tangy Manchego Cheese *The tortilla image shown is a visual representation and not actual size. Good to grip and built to dip, this sturdy chip is the king of the tapas table. It took 15 tries but we finally discovered the perfect recipe that brings a splash of Spanish Spirit to our tortilla line-up. The Deliciousness is all the Detail. Shape: Strip of tortilla chip that's made for gripping and dipping. Texture: fines White corn masa rested then gently Toasted for a smooth, Flaked texture that makes the ideal base for our trio of ingredients. 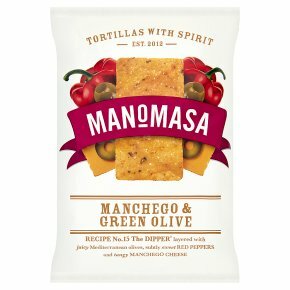 Taste: juicy green olives and sweet, mild Red Peppers are the perfect compliment to tangy Manchego Cheese, making this an irresistible Iberian delight. Savour: the perfect addition to a Tapas spread, munch on their own or dip into a creamy sauce such as Aioli.